In this new telling of Mexico’s Second Empire and Louis Napoléon’s installation of Maximilian von Habsburg and his wife, Carlota of Belgium, as the emperor and empress of Mexico, Maximilian and Carlota brings the dramatic and tragic story of this six-year-siege to life. From 1861 to 1866, the French incorporated the armies of Austria, Belgium—including forces from Crimea to Egypt—to subdue the regime of Mexico’s Benito Juárez during the time of the U.S. Civil War. France viewed this as a chance to seize Mexican territory in a moment they were convinced the Confederacy would prevail and take over Mexico. With both sides distracted in the United States, this was their opportunity to gain territory in North America. In 1867, with aid from the United States, this movement came to a disastrous end both for the royals and for France—while ushering in a new era for Mexico. 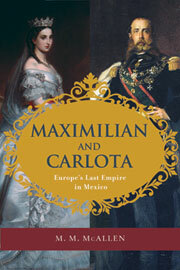 Maximilian and Carlota offers a vivid portrait of the unusual marriage of Maximilian and Carlota and of international high society and politics. A largely unknown era in the history of the Americas comes to life through this colorful telling of the couple’s tragic reign. Maximilian and Carlota as portrayed by John Huston in 1939.